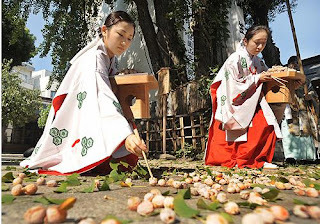 Video Japan: An annual ritual to harvest Ginkgo seeds is held at Kushida Shrine in Fukuoka's Hakata Ward on Oct. 6. A pair of about 800-year-old Ginkgo trees, known as the "Ginnan" couple with a height of 22 meters and a circumference of 6 meters each, stand side by side next to the shrine's main hall. The "Ginnan" trees attract many followers and admirers as the symbol of power to bless people's relationships and children because they produce a lot of seeds.